My husband loves chocolate and cheesecake, so when I'm baking something for him, those flavors always come to mind. 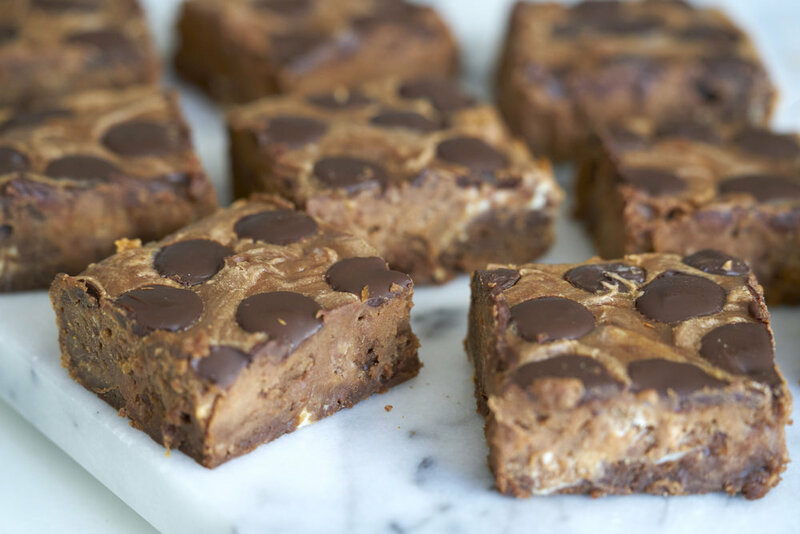 A decadent combination of the two would pretty much be the ideal combo to him, so cheesecake brownies seemed like an easy, but perfect solution! Rich and fudgy brownies are already great on their own, and I like 'em the fudgier the better! But now add a layer of cheesecake to the mix, and you've got yourself one seriously tasty treat. If you want, you can lightly swirl in the cheesecake batter to the brownie batter, creating a cool marbled effect on your brownies! I got a little carried away in mixing, so no picture-perfect marbling, but I promise they tasted great anyway! PS- I like using flatter, wider chocolate feves or discs instead of regular chips, and Valrhona makes great ones! Preheat oven to 350°F and butter an 8-inch square baking pan. For the brownie batter, melt butter and 1/2 cup chocolate chips in a double boiler over simmering water, stirring occasionally, until smooth. Remove from heat and whisk in sugar, eggs, and vanilla until well combined. Whisk in flour, cocoa powder, and salt until just combined and spread batter evenly into baking pan. For the cheesecake batter, whisk together cream cheese, sugar, egg yolk, and vanilla in a small bowl until smooth. Dollop large spoonfuls over brownie batter, then swirl in with a butter knife to create a marbled effect. Alternatively, you may mix the two together more evenly. Sprinkle remaining chocolate chips over the batter. Bake until edges are slightly puffed and center is just set, about 35 minutes, then allow to cool. These are equally as delicious warm out of the oven as they are at room temperature or chilled, although the brownies will be much easier to cut if chilled. Makes nine 3" square, thick brownies. *Adapted from cheesecake-marbled brownies by Smitten Kitchen. 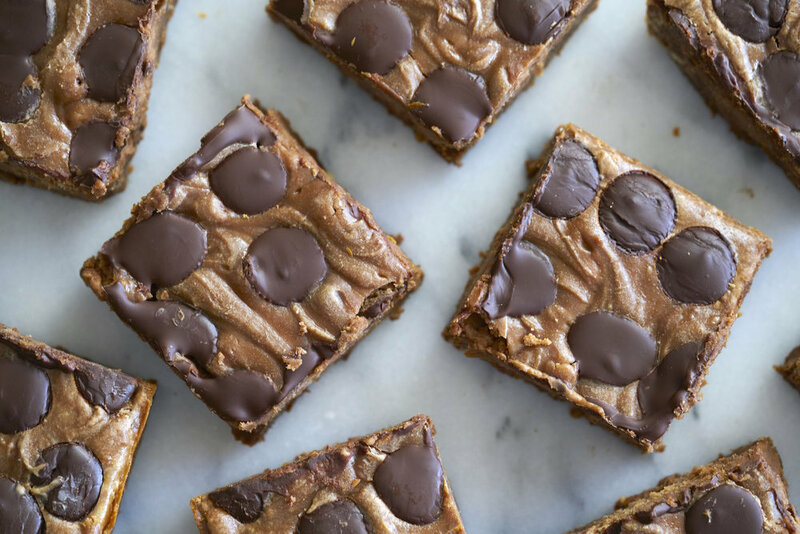 Blondies and brownies are both highly appealing to me, and I think there's a time and a place for both. I fall into the camp of "the fudgier, the better", so underbaking is always encouraged! 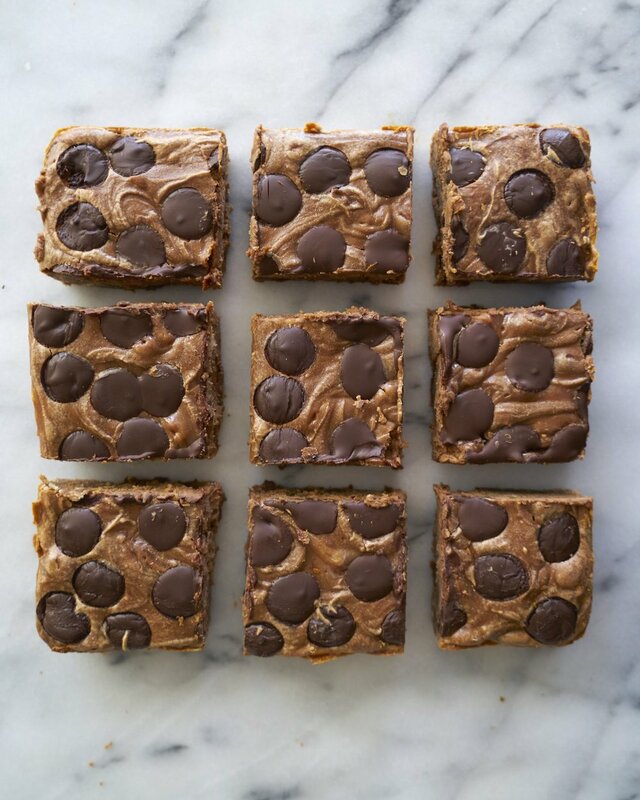 These blondies have an almond butter base, but feel free to use any other nut or seed butter if you prefer. I love playing with different mix-ins depending on my current cravings. This time I went for the never-fail combination of chocolate chips and shredded coconut. Enjoy! optional mix-ins: 1/2 cup coconut, chocolate chips, nuts, banana chips, toffee bits, etc. Preheat oven to 350 F. Grease an 8in square dish (alternatively, line dish with parchment paper, leaving some overhang on all sides). In a stand mixer or mixing bowl, mix together nut butter, coconut oil, and sugar until well combined. Add in egg, almond milk and vanilla. Mix in dry ingredients until just incorporated. The batter will be thick and sticky. Add any mix-ins last if desired (I love chocolate chips and shredded coconut). Spread batter evenly into the prepared baking pan, and sprinkle leftover mix-ins on top. Bake for 20-22 minutes, until edges have turned golden brown. Cool completely before slicing. Enjoy! Makes 8-12 blondies. *Adapted from Peanut Butter Blondies in Vegan Cookies Invade Your Cookie Jar. My best friend Stephanie is a registered dietician and plant-based chef who runs a vegan food truck in Texas called Ripe Cuisine. You can find tons of delicious, yet good-for-you recipes on her site, many of which you'd never know are vegan! Her motto is "eat with a purpose", and it's comforting to know you can do just that, even when a craving for sweets hits! When I want a brownie, I want it to be rich and fudgy, and that's exactly what these are. Stephanie's recipe includes a secret ingredient- black beans- but don't let that deter you. I promise you'll enjoy these just as much as any butter and egg-filled brownie, but you can feel good about the fact that they're both vegan and gluten free! Preheat oven to 350 F. In a double broiler, melt chocolate and coconut oil together. Remove from heat and set aside. In a food processor fitted with a steel blade, combine black beans, cocoa powder, palm sugar, maple syrup, vanilla extract, and salt. Pulse a few times to begin to breakdown beans, and with the motor running, pour in the melted chocolate-coconut oil mixture. Continue to process until smooth, stopping to scrape down the sides of the work bowl, as needed. If adding in extra chocolate chips, nuts, etc., now is the time to stir them into the batter. Using 1 tablespoon coconut oil, grease a 9 inch x 9 inch pan and pour in brownie batter. Bake for 45 minutes until brownies are set. Allow to cool for 30 minutes for brownies to firm up before cutting. Allow them plenty of time to cool and firm up before cutting. Enjoy!